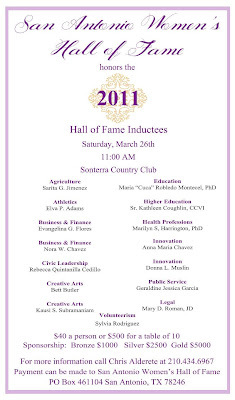 San Antonio's Women's Hall of Fame honors the 2011 Hall of Fame Inductees, March 26th @ 11 a.m. @ the Sonterra County Club off Stoneoak Boulevard. 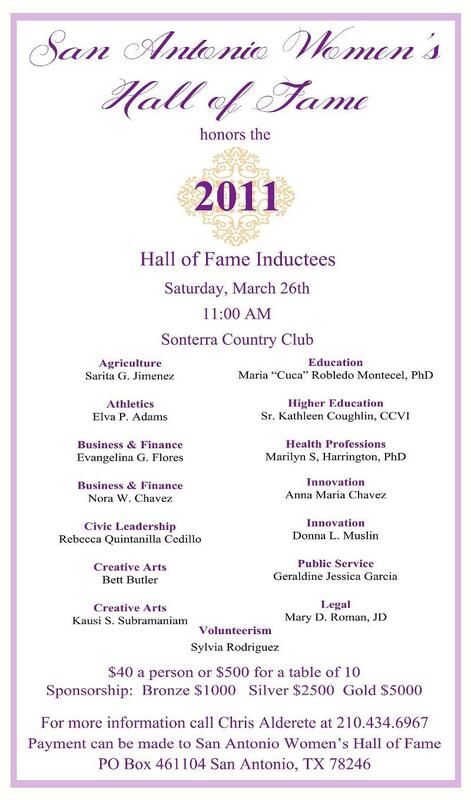 RSVP: Chris Alderete @ 434-6967. Walker Report receives lots of requests to post upcoming political events as well as other kinds of events and if possible we cover them well. We do have a few rules we live by. A candidate can promote their campaign, but we don't post comments derogatory of their opponent. Also we don't post photos with people with eyes closed, open mouth unless they hold a microphone, or it is in context. 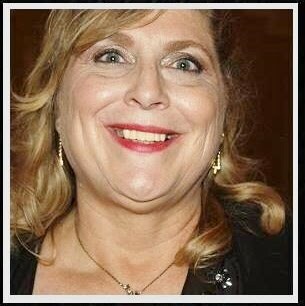 We don't promote alcohol or cigarettes or unflattering photos. We are a family blog and adhere to those expectations. Wow! Walker Report has hit over two million+ & moving up on the blog to 3 million!!!! Total hits through Walker Report, Google & Bing is 2 million, 940+ thousand+ to include hits from 13 countries!!! Numerous celebrities, nationally elected officials and Bexar County's everyday people appear on the Walker Report. Names like former President Barack Obama, & former Secretary of State Hillary Clinton, Minority Senate Leader Charles Schumer, former Speaker of the House Newt Gingrich, & Speaker of the House Nancy Pelosi, Governor Greg Abbott, Lt. Governor Dan Patrick. Land Commissioner George P. Bush, Senators Ted Cruz & John Cornyn, San Juan Puerto Rico Mayor Carmen Yulin Cruz Soto, former Pct 2 Commissioner Paul Elizondo, current Commissioner Pct. 2 Justin Rodriguez Presidential candidate for 2020 former HUD Secretary Julian Castro & more are posted. We cover everybody anywhere.